A year ago, head of government communications Alex Aiken described internal comms as ‘the Cinderella of the practice.’ In almost the same breath, digital comms at the Department of Health was described as ‘one of the strongest teams in Whitehall’ in the Government Communications Service's Digital Capability Review. (Not to blow our own trumpet). We thought: let’s fix this. So in November 2013, with our Internal Comms colleagues, we began gathering needs, stories and requirements from our users – DH’s 2200+ staff – and building up a picture of what would make staff’s working lives more efficient, less stressful and, with apologies, more digital. Last Wednesday it went live. We think this is the first internal digital service to be assessed against the Government Digital Service's Service Standard. We took a long time over our discovery phase. With the help of lovely agency DXW, we built a minimum viable product (MVP) in January which landed positively with over 100 staff. After a few months’ enforced freeze, lovely agency WTG took up the baton to build a beta, which ran through three sprints in 3 months and eventually attracted almost 20% of the department into our beta MVP (whoever said civil servants don’t embrace change). We blended Prince2 and as much Agile as we could manage. We copied the GOV.UK style guide for content. We ran a careful, season-long engagement programme with staff at all levels of ability and appetite. We met user needs with a bunch of existing tools like Eventbrite and Relevanssi, because they’re awesome and free. We hosted in the cloud. And even as we launch, we are confident that this third MVP is only the beginning of a continuous development process that will run over at least another year. We think this is the first digital service anywhere in government to save more than 100% over the service it replaces. The new intranet will cost around 15% of the running cost of Delphi, DH’s old intranet. But there’s more. At the moment core processes on the intranet – publishing things, searching for stuff, filling in forms – take staff ages. Our time trials with staff show we can (conservatively) save each of them 30 minutes per week just by optimising some key user journeys. In saved pay alone, that’s well over £1m of efficiency savings a year.Putting digital efficiency in such blunt terms resonates strongly with stakeholders around DH, so we’ll be using this blunt-instrument pricing model to justify a lot more internal change from now on. We think this could be a digital ‘gateway drug’ for civil servants. DH’s Permanent Secretary Una O’Brien recently charged the DH digital team with ‘catalysing change around the department’ and we think there is no greater way to deliver systemic change than to show staff how high the standard is that we expect them to provide to citizens. By demonstrating the digital framework to staff – by giving them a modern digital tool for work every day – we both challenge DHers to up their digital skills, and empower them to think about how easy the rest of their workflow should be. Finally, we think we managed an internal civil service change pretty well. 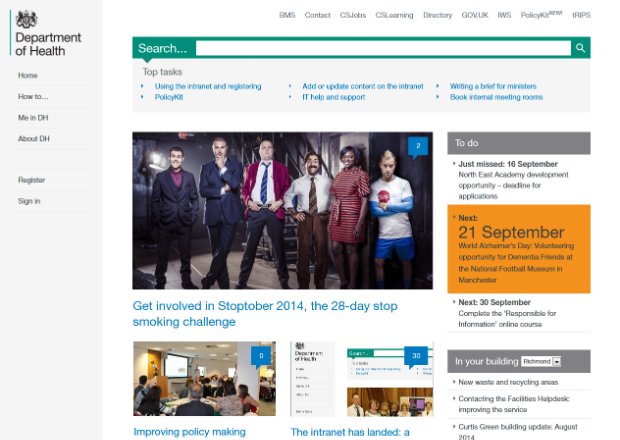 DH’s intranet represents a central knowledge bank for policymakers, project teams and changemakers, and a single news source keeping them in touch with a whole health and care service. Getting to integration (and getting 10 years of legacy content brought up to scratch) takes a lot longer than people expect. We expected it, and as a result delivered an agile, fast-moving project a day ahead of a target date we set back in March. Naturally this is only one of the projects we’ve taken on this year, and internal change represents a small minority of our work. However, for too long these cobblers’ children have waited patiently, when a relatively quick, careful, cheap piece of work was all that was needed to fix the problem. So all we’ve really done is create a website for, at most, 2200 people to use every day. Thanks to the 400 DH staff who helped imagine, design, test and share in the open, it landed not with a bang (and not with a whimper) - but with a resounding response of ‘thank you, this is what we wanted’. I'd love to see what the Directory" looks like from the inside. And any notes on "personalization" would be welcome. Can't see a list for "Groups" at the top, or "channels" as they sometimes get labelled.